Apparently the authority behind Lumpini will travel to France October 29, 2010 in Paris to bring an official title match under their auspices. There was a previously unsuccessful attempt by Farid Villaume last summer in Thailand to bring home Lumpini gold. And now two names have been named to face off for a Lumpini title in Paris: Saiyok Pumpanmueng and Abdallah Mabel. From the well known camp of Team Nasser K, Abdallah Mabelhas been both busy and high profile. 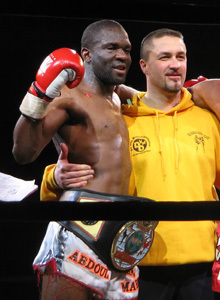 Mabel won last year In Marseille against Farid Villaume. Villaume is considered number one in his class by the French federation contact sports. Saiyok recently came out with a wide points win against Antuan Pinto at the WMC Queen’s Birthday event promoted by Elite Boxing. Saiyok is known for his death defying use of timing and space which could be characterized as borderline dangerous for himself. As a result Saiyok has become beloved for his audience pleasing style and entertainment value of his fights. A precedent has been made in the past for Thailand’s stadium titles being contested in foreign lands when Japan’s Takeda Kozo won the Rajadmanern Stadium welterweight title way back in 2001. Albeit in my opinion Takeda’s Thai opponent was over matched both in size and strength. This particular matchup looks pretty even both in terms of size and skill. The fight will take place in class 154 lbs (about – from 69.85 kg). This is the first time a champion of Lumpini will win a title outside the borders of Thailand. Expected to be announced will be more French nakmuay versus top tier Thai talent to fill out the undercard. ~ by fatsoking on October 14, 2010.
i hope saiyok smashes mabel to pieces.